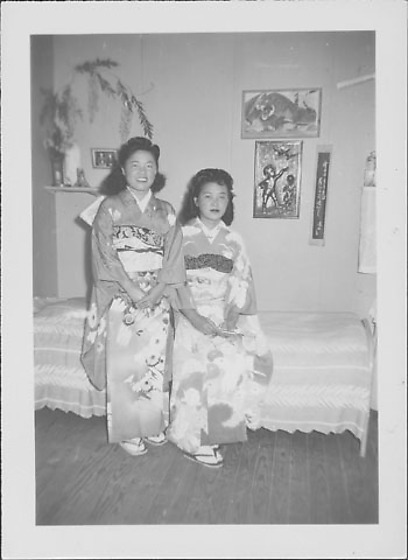 Portrait of two young women in kimono with furisode sleeves in a bedroom at Rohwer concentration camp, Rohwer, Arkansas, 1942-1945. Smiling woman on left stands with hands clasped in front of her while other woman sits on bed holding a fan in her hands. Wisteria vine in a vase sits on a small shelf in corner, TL; a few framed pictures, including a tiger, hang on wall at CR in background. Same women and location in 97.292.6BY. Woman on L is in 97.292.8I. Woman on R is in 97.292.8H.